The weekend before Christmas I hosted a girls-only holiday craft party. 10 of my girl friends fit perfectly in my apartment. We chatted and laughed, with homemade buttered rum, chocolate desserts, and every color of yarn you could want. 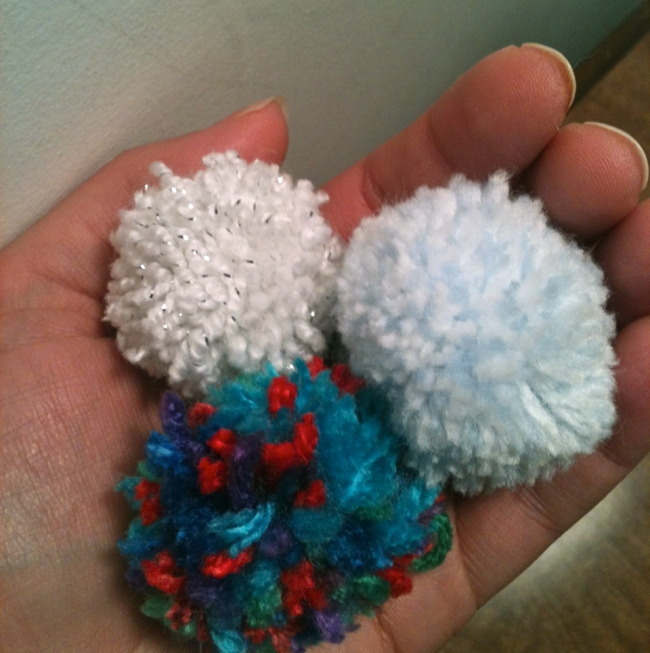 I taught a tutorial on how to make a pom pom, using either a fork or a toilet paper roll. We made pom poms for our hair, our gifts, our hats, and each other. Some of us wrapped up gifts and created stamped gift tags. I also offered oranges and cloves to create pomanders. The pomanders smelled heavenly and looked so pretty with their red bows. A craft party is busy and messy but a lot of fun. Despite the smudges on the walls, the grease in the oven, and the cheap carpeting, I am happy to be living in an apartment that feels like home. I have 2 awesome roommates who are polite, generous, and fun to live with. The 3 of us hosted a house warming party to celebrate the new place. We celebrated with our friends, and beer, and music, and a giant crossword puzzle in the shape of America. This was one of the easiest and most comfortable parties I've hosted. The atmosphere was friendly and happy. At the party I offered 11 x 17 paper and assorted drawing supplies for our guests to design us one-of-a-kind place mats. Our friends had fun drawing together and thinking up some creative ideas. It was a fun party activity, and we ended up with some special, humorous, and personal house-warming gifts. Each paper will be laminated so that we can use them as place mats when we eat!